A Conversation with Barry Olivier, Founder and Director of the Berkeley Folk Festival. Thursday, May 26, 2011, 5-7pm – Forum Room, South Tower, Floor 2, Northwestern University Library. In 1974, Barry Olivier sold his archive of Berkeley Folk Festival materials to Northwestern University. This spring quarter, students in Digitizing Folk Music History, a research seminar offered by Northwestern history and American studies professor Michael J. Kramer, are assembling interpretive digital history projects around the materials in Olivier’s archive. 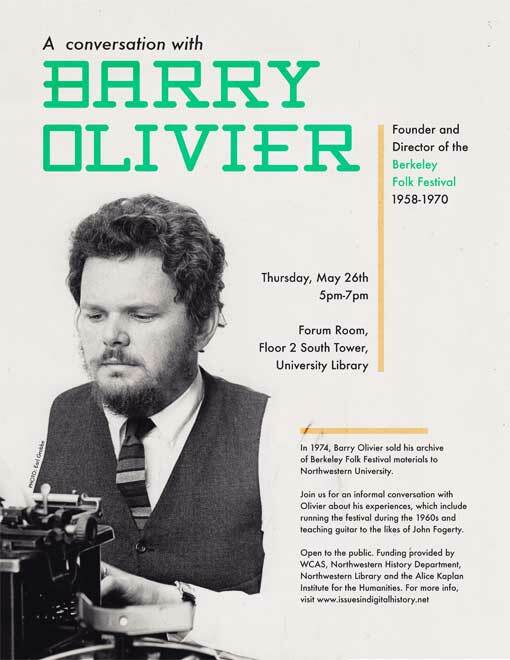 Join us on Thursday evening, May 26th, 5-7pm, in the Northwestern library’s Forum Room for an informal conversation with Olivier himself about his experiences, which include running the festival during the 1960s and teaching guitar to the likes of John Fogerty. Digitizing Folk Music History is part of Digital River of Song, a larger initiative in the digital humanities focused on creating a cross-institutional, archivally-based online learning community for the study of folk and vernacular music. This event is open to the public and is generously funded by Weinberg College of Arts and Sciences (including the Simeon Leland Forum Fund), the Northwestern History Department, the Northwestern Library, and the Alice Kaplan Institute for the Humanities. Map to the Northwestern University Library. For more information, see www.issuesindigitalhistory.net or contact Dr. Michael J. Kramer, mjk@northwestern.edu. Note on the poster: Inspired by the posters for the Berkeley Folk Festival, Gus Wezerek, a student in the class, designed the flier for our public event with Barry Olivier. Gus’s interpretive digital history project focuses on the cultural significance of graphic design used at the Berkeley Folk Festival. Bravo Gus!